Hi guardians! afpac here with the first big update of Season 3. Today's update brings with it a new set of challenges to the collection manager: Foundries! After the launch of the previous update, the consensus seemed to be that achievements were a cool, welcome addition, but that too many of them were very similar. I felt that feedback was valid -- a lot of the achievements in the initial release were very similar simply because I had to code them all. Making them similar meant it was easier to create "enough" achievements for each category without making the Season 3 update wait forever. Now that the site is caught up to Season 3 and I'm free to pivot to the next thing, I wanted to come up with a different take on the collection/achievement grind that focuses on what I feel is one of the most under-utilized but interesting components of Destiny: Foundries. While the Foundries tracker does not have a leaderboard or points associated directly with it, the achievements you earn here do apply to the Achievements leaderboard. There are 49 new achievements to earn here, along with new meta-achievements. This is my first stab at trying to innovate on the stuff that was added with v1.2, so hopefully you guys enjoy the idea and the direction I'm heading with the achievement system. What's the deal with this tracker? The Foundries tracker is a new approach to a collection challenge. On this tracker, you pick a weapon foundry to champion, and you can then complete achievements using that foundry's weapons. Do I get points for this? Is there a leaderboard? There is no leaderboard for foundry collection itself, but the achievements you gain from this tracker do apply to the achievements leaderboard. How do you decide which weapons belong to which foundry? Weapons are considered a foundry weapon based on if they have the foundry's branding in the upper-left when you inspect them in game. This information is available in the Bungie API files, and I'm using that to assign weapons to foundries. Don't some foundries have more weapons? They definitely do. SUROS and Omolon have roughly 50% more weapons to collect than Hakke and VEIST. However, by the same token, some foundries' weapons are more popular than others, meaning you've probably already collected a fair number of them and potentially already earned a decent amount of masterwork kills. With that taken into consideration, I think the amount of work required for the guns that you actually will have to hunt is roughly the same for all 4 foundries. What happens once I'm done? Once you complete the "Put a Bow On It" achievement for a given foundry, you are free to switch to another foundry and work on their achievements as well. There is even a meta-achievement for completing all 4 foundries if you like a challenge. Can I change which foundry I champion? You can, but doing so will reset all progress for your current foundry unless you have completed the "Put a Bow On It" achievement for that foundry. Can I work on a foundry if I'm not championing it? You will not earn achievements for foundries you are not currently championing. However, there's nothing stopping you from collecting other foundries' weapons and earning masterwork kills toward them even if you are not their champion. Once you switch to another foundry, any achievements you've earned based on what you've collected in the meantime should kick in shortly. Explain the Brand Warfare achievements. These achievements take a look at the masterwork weapons currently in your inventory. Any kills registered on weapons that you have dismantled prior to earning the achievements will not contribute. What happens as weapons are added to the game? As weapons are added, they will be added to the conditions for the achievements as well. However, any achievements that you have unlocked will stay that way. It doesn't seem fair to require you to keep every weapon on the off chance that more weapons are added to a foundry later. "Top of the Line: Hakke" is unobtainable Right you are! As of now, Hakke has no exotic weapon. I'm going ahead and building the achievements with the assumption that it eventually will, by the time someone gets close to completing "Put a Bow on It" for Hakke. If it ends up being a bottleneck, I will definitely remove the "Top of the Line" completion requirement from the meta-achievement until Bungie actually creates a Hakke exotic. I hope you all enjoy the update. As always, I look forward to hearing your feedback. Hit me up on Twitter @lightdotgg, on the Discord server, or on the replies below! Hi guardians! Version 1.2 brings an entirely new component to the site: Achievements! The classic console gaming achievement hunt that Destiny 2 is sorely lacking is now a part of the light.gg grind. On top of the achievement system, all leaderboards have been updated for Season 3, along with a ton of other changes. Check out the full list of them below, and let me know what you think! The player profile page has been integrated into the collection manager. This will allow you to view exactly what another user on the site's collection looks like, where their points are coming from, etc. To swap back to your own profile, either click the "Collection" link in the top header bar or use the account selector in the top right corner. This also works for Armory searches for players that may not be light.gg users. However, because of Bungie.net privacy settings, you likely won't be able to see much on the trackers for people such as this. The progress graph on the previous version of the player profile will make its return in a later patch. All ornament trackers now show the actual progress toward their goal instead of just the "yes/no" checkmark. The tracker icons on the left now show their name when hovered. All "Overall" percentages are now based on scoring instead of being an average of components such as owned, max power, skins, etc. Your overall completion % will be your current score / the maximum possible score. A new achievement system has been added. You can earn up to (as of now) 1,300 leaderboard points by completing achievements. When you earn an achievement, a toast will pop up and a small "ding" will play. You can click on the toast to hop to the category that the achievement falls into. You can disable these toasts by clicking the icon on the Achivements tracker. Your preference will be saved to your device. There are currently 200+ achievements across 10 different categories (one for each non-achievements leaderboard, and ~24 under 'General'). The goal is for the majority of achievements to be earnable by everyone that commits the time to them. That being said, some of the achievements are purposefully ludicrous to give us all something to work toward as we get later in the season. Scoring is built in such a way that the more achievements you earn, the more points they are worth. Points are earned at specific thresholds and lock in once earned. Achievements will be added and removed throughout the season as it makes sense to do so. Some achievements will cause parts of your inventory to lock in. For now, this only applies to emblems and owning all of their variants. As the season progresses and inventory space begins to clog again, I plan on adding lock-ins for other achievements so you will be able to dismantle items but still receive credit. The Followers of Osiris leaderboard has been removed. The items that it used to track are now visible under the Vendors & Engrams tracker. A tracker, leaderboard, and 22 achievements for Warmind content on Mars have been added. Masterwork scoring has been overhauled. This season, the majority of the points available on the tracker will come from achievements (29 to start). Each masterworked Season 3 item is worth 1 point. All season 1 and season 2 masterworks are worth zero points. Check out the Season 3 Leaderboards post for the rationale behind these changes. The Exotic Armor & Weapons leaderboards have been merged into one named Exotic Gear. Exotic Armor is laid out a little different now since the horizontal orientation per item slot didn't really work anymore. Warlocks have too many helmets. Scoring for this season focuses heavily on collecting Season 3 exotics and unlocking exotic Masterworks. Goal Items have been updated for Season 3, including new seasonal progression items from Zavala & Shaxx. 38 Achievements have been added for activities ranging from collecting Nightfall exclusives to reaching Glory rank Legend. Your current Glory and Valor ranks will now display over the Crucible faction banner. Ornament objectives have been updated for Season 3. The BrayTech Rocket Launcher has been confirmed as the Nightfall Exclusive drop for Strange Terrain, and will be scored as such on this tracker. It's also worth points on the Mars tracker. Once we have Will of the Thousands as the Nightfall and determine its exclusive item, the tracker will be updated with that as well. Spire of Stars items have been added. This tracker will be revisited come July once raid lair prestige modes become available (assuming it actually has an impact on the loot pool). Armor ornament tracking has been removed from this tracker as there are no ornaments for Season 3. Cosmetics added for Season 3 have been added to the tracker and are worth 10 points each. Season 3 Iron Banner weapons and ornaments have been added. These have rank requirements, but those aren't in the files for now. I will update once I know what they are. Looking at the preview Bungie posted, it looks like there may be some items that are classified or just not in the files yet. I will update the tracker on Tuesday when the event is live. Updated w/ weapons for Season 3. Dead Orbit appears to have one weapon missing right now in the files. While the S3 ornaments are present in the API files, they appear to just be placeholders as they have the same icons as the Season 2 ornaments. I will update these assuming they eventually will have slightly different objectives. Season 1 emblems are no longer worth points as they've been around long enough that they're just inflating the number of points available on this tracker. All emblems with variants now have a lock-in mechanic. Once you unlock all variants, your progress on those items will lock-in, and you will no longer need to keep a copy of the base emblem in your inventory to receive credit. Credit being granted by a lock-in achievement is indicated by an orange border around the item. Hello guardians! afpac here w/ a huge update for Season 3! As I'm sure many of you also experienced, my interest in the game waned quite a bit toward the end of Season 2. The state of the site, unfortunately, mirrored that. A lot of the things that I was working on got put on the back burner as I just wasn't really playing the game, making me less interested in working on the site as well. Regardless, I'm fully hyped for Warmind and am back at it with a ton of changes (with even more on the way). Here's hoping that Bungie will release interesting content at a more steady pace over the season so that we can all stay engaged with the game until the big expansion in the fall. The Mercury (Followers of Osiris) leaderboard has been replaced by the new Mars leaderboard. In Season 3, Mercury definitely isn't going to be relevant any longer and in retrospect, may not have been entirely worth a leaderboard in the first place given the fairly small amount of content available there. At the risk of repeating the same mistake, a new leaderboard will be created for the content available on Mars in Season 3. With Hive Exclusion Protocol gear, something resembling the Calcified Fragments grind (which could potentially lead to an exotic questline), and presumably Mars Faction gear, there ought to be enough to track on Mars to justify it taking the leaderboard spot vacated by Mercury. The items that were previously visible under the Mercury tracker are now visible under the Vendors & Engrams tracker. Next up is the Exotic Gear leaderboard. I nearly pulled the trigger on merging Exotic Armor & Weapons in Season 2, but decided against it at the time. With the addition of Exotic Masterworks and my desire to build good progress tracking for the unlocking process, it doesn't make sense now to duplicate all that across two leaderboards when they are so similar. Moreover, the total number of items being tracked by the merged leaderboard is a lot more in line with what's going on with the other leaderboards. More info to come on this once Warmind launches and I am able to poke around in the files to see what sorts of objectives Bungie is setting in order to masterwork Exotics. The Season 2 implementation of the Masterwork tracker was more or less a mess. The intention at the time was to encourage a grind but not insist upon it. The thought was that if you got clogged on inventory space or just didn't feel like hoarding a bunch of items you didn't really care about, you didn't feel like your score would be injured too much if you dismantled a masterwork. However, in practice, the thresholds I set for diminishing returns were way too liberal, to the point that the values stayed high enough for long enough that it almost always made sense to keep at least one copy of any masterwork you picked up. Beyond the inventory clogging concerns, the tracker itself didn't feel particularly interesting either. It's really just a checklist of all legendary armor and weapons. I think we can do better. Different achievements and/or groups of achievements will give points for being completed, and most importantly, those points are locked in once you earn them. This hopefully will enable everyone to grind out certain achievements but not feel compelled to keep absolutely every Masterwork you find. Beyond that, I'm hoping to make achievements that reward normal collection (such as masterworking a full set of armor for your Titan, Hunter and Warlock) but also some more fringe stuff (such as masterworking a set of armor that grants 10+ Resilience) so that the tracker provides some challenge beyond just "collect all of these very RNG upgrades". One of the ways in which Destiny has always been lacking is the classic console gaming achievement grind. For Xbox players, there are a measly 13 achievements -- none of which cover any content beyond the base game. PlayStation is similar, and PC players don't get any achievements at all. Achievement grinding has always been one of my favorite grinds toward 100%ing a game, and the addition of achievements to the light.gg goals is a start at filling that gap for Destiny. Once you complete this achievement, the tracker will always display that you own all Season 3 Exotic Armor, even if you no longer actually have those items on your characters. The other important component of the Achievements leaderboard to mention is its scoring system. 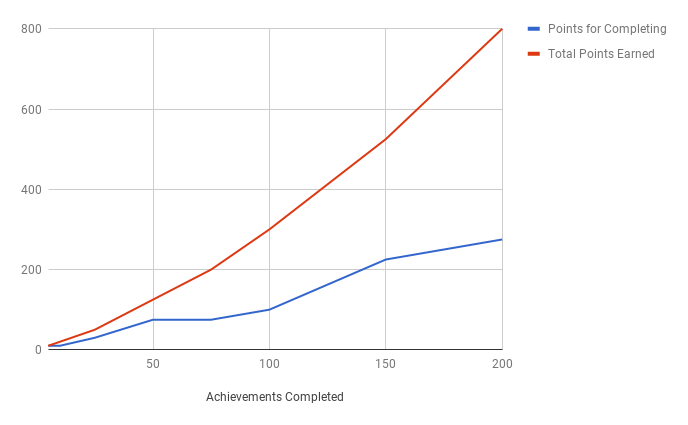 The biggest thing to understand is that each individual achievement is not inherently worth any points (at least on the Achievements leaderboard -- some trackers grant points explicitly for achievement completion). As of right now, there are two ways to score on this leaderboard: 1) Completing entire categories of Achievements 2) Completing certain thresholds of achievements. Completing categories is simple enough to understand: each leaderboard has its own category, and once you complete every achievement in a category, you gain 50 points for knocking it out. The increase in point value can been seen in that the two lines get farther apart from one another the more achievements you complete. Since Nightfall Exclusives (drops and emblems) were added late in Season 2, they will still be weighted fairly heavily. We still haven't had Exodus Crash at all, for example, so I want to provide proper incentive to grind out those emblems and the sparrow. Again, a large chunk of the Season 2 emblems were added fairly late in the Season, so I still want to provide some incentive to go get them. Season 2 emblems have a slightly diminished value (again, to prioritize doing the most recent content), but it'll still be worth your time to go get those Mercury exploration emblems & variants, for example. That's it for the breakdown of what the light.gg leaderboards will look like in Season 3. As of now, I'm hoping to have all of this ready within a week of Warmind's launch, so keep an eye out. Tweet @lightdotgg or join the Discord server and let me know what you think! TLDR Ornament scoring now in place. Equip an ornament on any piece of armor it applies to, refresh your collection, and permanently earn credit for it. TLDR Season 2 will officially begin with the weekly reset Tuesday, January 9 at 12:00 PM Eastern time. Today I'm pushing the first update since the huge roll out of version 1.1. With the holidays and the huge amount of work that went into 1.1 prior to its launch, I've been taking a bit of a break. However, I'm back at it, revitalized, and ready to get Season 2 fully rolling. As a bit of a post-mortem on the 1.1 launch, it seems like the update has been a huge success. Versus last month, traffic to the site has more than tripled! This means more competition on the leaderboard and more people to spread the word about the site, which is good news for all of us. Increase in traffic aside, there were some things left unfinished in the previous update. The biggest among them is Ornament Scoring, which today's update aims to fix. As discussed in the 1.1 blog post on Season 2 Leaderboard scoring, the Bungie API doesn't give me a great way to track progress toward unlocking ornaments. In an ideal world, I'd be able to show the same progress bar that you see in game, to be able to see that you're at X out of Y toward each component of each requirement. Unfortunately, there's just no way to see that progress in the API at the moment (or I'm an idiot and can't find it -- also a possibility). Regardless, the system I've come up with for today's update allows us to begin earning credit for unlocked ornaments. To earn credit for an ornament, you simply need to equip it on a piece of armor and refresh your collection. From that point forward, you will maintain credit for that ornament even if you no longer own one of the items it applies to or have it equipped. This is accomplished through a new "permanent progress" system behind the scenes, which (like a lot of the changes in 1.1) gives me some nice foundation for exciting things in the future. With ornament scoring now in place, Season 2 is ready to officially begin. While there are certainly going to be more additions to the scoring model (prestige raid lair being the most obvious addition), I believe what we have now is a good starting point for the Season. Eyeballing progress across the leaderboard, it seems like contribution from each goal is roughly in line with the overall effort required. All of that being said, unless something drastic changes between now and then, I am planning on Season 2 officially beginning with the weekly reset on Tuesday, January 9. This will give me time to kill any bugs that fall out from ornament scoring, make any final adjustments to the overall scoring model, and so on. Thanks for checking out the update. There are some more fixes going live with these changes that aren't covered above, so feel free to check out the full update notes below. Join the Discord server or shoot us a tweet @lightdotgg to let us know what you think! NEW Any item that registers as a Masterwork should now show its kill counter in the item's tooltip, provided the count is greater than zero. Once the item shows in the Ornaments sidebar with a pink checkmark, you will permanently receive credit for that ornament, even if you no longer own the item or no longer wear the ornament. BUG Collection should load significantly faster. I'm no longer rebuilding the list of goal items every time the page is requested, just once in a while. This may have some consequences when a new manifest file is released from Bungie, but for now, it should be a big performance increase for everyone. BUG The change to improve collection speed should also greatly increase the speed at which Player Profiles load. Edit 3:00 PM 1/4: This speed-up change caused some pretty big, server-melting issues when pushed to the live server and has been rolled back for the time being. I will work to speed this up again in the next release. With the 1.1 update to light.gg, I'm proud to announce, in my opinion, one of our most exciting new features: the light.gg Database. As a WoW player for many years, it blows my mind that 4 years into Destiny we still don't really have a Wowhead equivalent. There are database sites out there for sure, but none of them really have the same feel of super flexible, interface-driven filtering to me (without forcing you to memorize text filters or learn regular expressions to make them work). I want the community to be able to, with a few simple clicks, find every Rare Warlock Bond in the game, see what new items were added to the game for their Titan in the most recent update, or really any other cross section of the item database. Creating the database gives us the groundwork for some other cool features too. You're now able to hover over any item and view its key perks, any notes on the item (such as how to obtain it), and more to come in the future. From there, you can now click on any item to see its detailed stats, Lore (when available), and Manifest definition. Signed-in users can also review every item in the database (Default Ornament Perk, 1/5, would not use). When reviewing weapons and armor, you will be able to give two different scores: one for PVE and one for PVP -- we have the technology to separate them... take notes Bungie 😏. You can also upvote/downvote reviews to help provide the community's consensus on any item. The item's overall review score will be based on the average of these two ratings across the board. You'll be able to see the individual scores next to the item in database search results and on the item detail page, and eventually I want to add a sorting option to the database to let you sort any result by Overall Rating, PVE Rating, and PVP Rating. Hopefully you guys are as excited about the database as I am. It feels like a great start, with lots of potential for new tools to help people find what they're looking for and engage with each other. As always, I'm anxious to hear everyone's feedback on what you think of the database, what features you'd like to see built in to it, etc. Thanks for checking it out! As part of the 1.1 Update, the Collection Manager has been overhauled. The obvious change here is that the Collection Manager now takes up the whole screen. As we keep adding new trackers, it made less and less sense to only use 60% of the available screen to show information. Beyond that, the previous collection manager had every item rendered when you loaded the page, which, though fine at the time, isn't sustainable as we keep adding more and more items to track. With the new collection manager, each tracker has an icon in the left menu that will let you jump to a full-screen view of its items. Any tracker with a corresponding leaderboard also shows your scoring breakdown for each of its goals. Swapping between trackers is a lot faster than in the previous version (try jumping from Eververse to Exotic Weapons -- much more pleasant now). Read more about the new Season 2 Leaderboards here. Clicking on any item will take you to that item's detail page, where you will be able to leave reviews, find similar items, view lore, and so on. Can't wait to hear what you all think of the new collection manager!